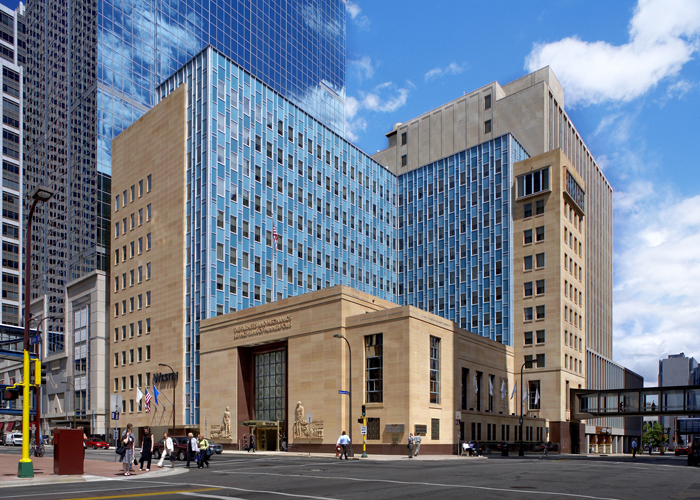 The 10-story Farmers and Mechanics Bank in downtown Minneapolis was originally built in 1941 and renovated in 1961. When it was converted into a 11-story, 216 unit luxury boutique hotel in 2006-2007, its historic status and listing on the National Register of Historic Places heavily influenced the design and renovation process. Conservation of the existing structure and finishes was required to obtain historic approval, while implementing various practical modifications to improve energy efficiency. The renovation included substantial structural removals and reinforcing to accommodate a two-story interior garden on the fifth and sixth floors and a swimming pool on the third floor, as well as underpinning for excavations below the tower foundations to accommodate increased loads from the added 11th story inserted at the interior of the building. The primary challenge of this project was to fit a new 11-story structure into the 10-story space of the existing structure, while preserving function and historic value. 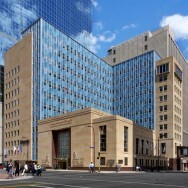 The obvious—and expensive—solution was to raise the roof, but MBJ instead designed a solution that increased floor height on the upper floor by 13” without raising the roof, saving hundreds of thousands of construction dollars and avoiding the perils of opening the existing roof to inclement weather. Ease of construction was a key goal of this project, so MBJ worked closely with Ryan to enhance the constructability of the design and provide appropriate solutions to found conditions at all points. For example, we reused scrap steel plate from demolition of the basement bank vault to create beam hangers for floor infills. A number of elevators were moved, leaving many large holes to be infilled. A standard steel connection solution for the floor infill support would have required hand demolition of hardrock concrete fireproofing around each beam to which the brackets were to be attached, an extremely expensive and time-consuming task. Instead, scrap steel was used to create brackets, which rested on the beams, making construction easier, costing little, and saving time. Other materials reuse included infilling large windows on the upper floor with historic exterior masonry removed from window cuts elsewhere.